The canvas on which our picture of the universe is painted relies on the unwavering acceptance of Hubble's Law. Hubble's Law states that a relationship exists between the distance to a galaxy and the speed at which it is receding from us. The farther away a galaxy is, the greater the speed of its recession and farther its spectral lines are shifted toward the red end of the spectrum. For Hubble's Law and the Red Shift Principal to be valid, it must work for not just a few galaxies, but for all. And indeed, it does -- well almost. In the observable universe, there are a few notorious exceptions to these rules. One of the best-known paradoxes is found high in the autumn sky, less than half a degree south of the bright galaxy NGC 7331 in Pegasus. Stephan's Quintet was discovered in 1877 by the director of Marseille Observatory, Édouard Stephan (1837-1923). This group has been the subject of many detailed studies and heated debates ever since. As the name implies, five galaxies comprise Stephan's Quintet. The first, NGC 7317, has been classified as an E2 elliptical because of its slightly oval disk. Next, NGC 7318 was thought to be a single object when Stephan first spotted it, but it is now known to be two separate, overlapping systems. NGC 7318a is labeled as an E2 elliptical like NGC 7317, whereas NGC 7318b is a SBb barred spiral. NGC 7320 has also been found to be a SBb barred spiral, while NGC 7319 is a wide armed Sd spiral. All are crammed within a tight 20' area. The table below lists them all. The controversy surrounding these five galaxies stems from measured differences in their spectral red shifts, indicating that they lie at radically different distances away. Four of the galaxies (NGC 7317, 7318a, 7318b, and 7319) appear to be moving away from us at an average of 6,000 km/sec, placing them about 270 million light years away. The fifth, NGC 7320, has a measured red shift of only 800 km/s, indicating it to be about 35 million light years distant. What's going on here? Further examination of detailed photographs of the group show partial resolution of NGC 7320, with a level of detail similar to relatively nearby galaxies. The other four galaxies in the Quintet show only blurred features that seem to say they lie at much greater distances. 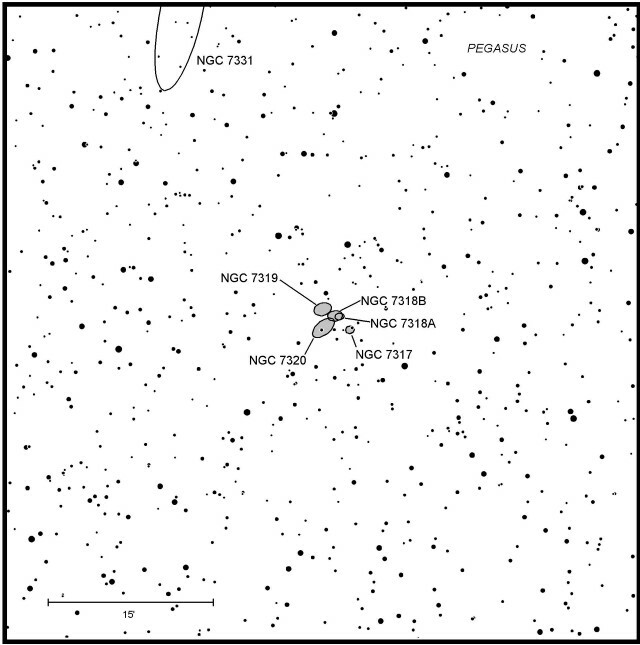 From this evidence, along with the difference in red shifts, many astronomers feel that NGC 7320 is simply a chance foreground object superimposed in front of a more distant galaxy quartet. In fact, it turns out that its red shift matches that of NGC 7331, which means that the two may be gravitationally associated. Additional studies by Mariano Moles from the El Instituto de Fisica Fundamental in Madrid also suggest that NGC 7318B is just passing by and not bound to the group either. Just as it challenges cosmological theories, Stephan's Quintet also challenges the observing skills of amateur astronomers. Can you spot them? The double galaxy NGC 7318a/b strikes me as the brightest in the group. Through my 10-inch reflector, NGC 7318a/b appears as a small 13th-magnitude glow measuring about 1'x½' of arc across. Its twin nuclei are only visible with averted vision, and then just barely at magnifications greater than 250x. Controversial NGC 7320 seems slightly fainter than NGC 7318a/b, but over twice as large. Visually, its disk spans about 2'x1', with a faint central nucleus seen fleetingly. 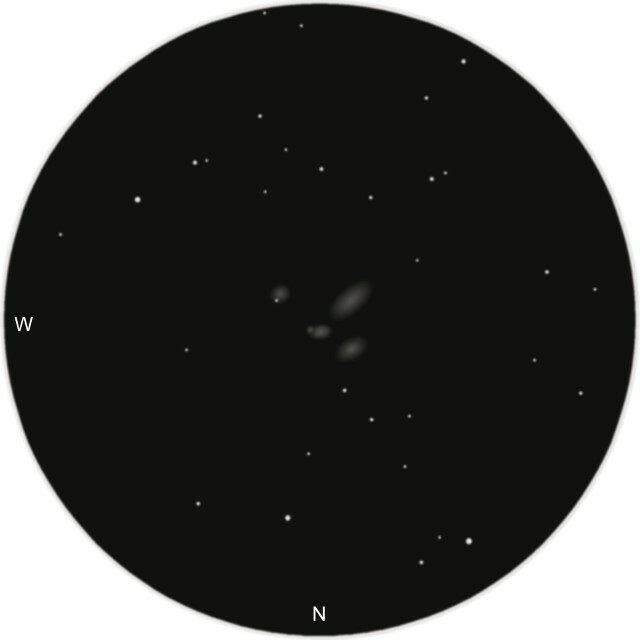 Above: A sketch of Stephan's Qunitet through the author's 18-inch (46cm) reflector at 171x. Of the final two galaxies, NGC 7317 measures less than 0.5 arc minute across and looks like a slightly fuzzy "star" even at high power. The existence of its tiny 14th-magnitude disk is further masked by the "glare" of a 12th-magnitude star found only a few seconds of arc away. Lastly, we come to NGC 7319. Though largest of the lot, this galaxy impresses me as the hardest to see. Even though it shines at 13th magnitude, its surface brightness is very low, which makes detection difficult. A star like central hub might be seen, but only after an extended examination with averted vision. I find it is best not to strain when trying to see faint, diffuse objects like this. Any stress will generate "noise" between the observer's eye and brain, causing enough distraction to miss a subtle target entirely. ...check the text... you got 7320 closer than Mars! Ha! Got it fixed. Thanks!! 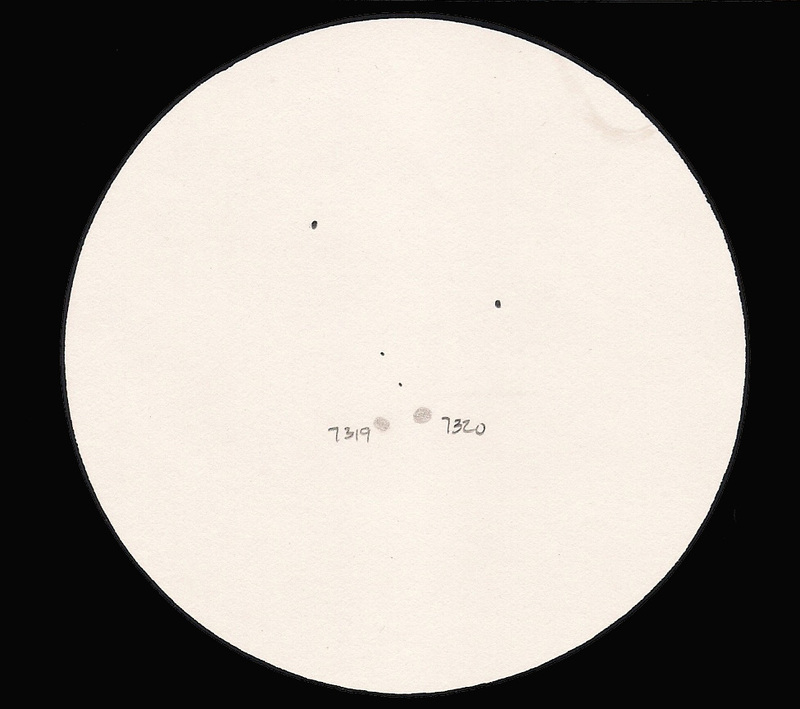 I once glimpsed the group as an irregular faint patch in my 1986 6" f/8 A-P refractor. I was using a 16.8 Orion MegaVista eyepiece providing 74x and 0.9 degree field. I could not really say that I could identify individual members. I may have done better if, as you did, employed higher magnification. Of course, more aperture wouldn't have hurt! That's pretty darn good, John! Must have been some great skies to see them in a 6". Your comment made me dig back through my notes to see my impression through my RV-8 8" f/7 Newt. Back on Aug 22, 1987, from Northfield, MA, I recorded that NGC 7320 appeared brightest, followed closely by 7319. I didn't see any of the others. I was using 17mm Plossl and 12mm Konig eyepieces at the time -- things like Naglers were still in the future! The dark skies of Cherry Springs State Park certainly helped! I'd still like to give it another try using higher magnification. At the time I reasoned that the approx. 2 mm exit pupil was optimal, but I've since learned the benefits of trying a variety of magnifications. BTW, speaking of Naglers, do you still use the 22 T-4 in your 18 f/4.5? If so, do you use it straight or with a Paracorr, and do you notice any issue with field curvature? I've reached a point where my astigmatism is very noticeable above a 2.5 to 3 mm exit pupil, and was considering replacing my 20 T-5 with the 22 T-4. Actually I never had the 22 and I sold my 18 about two years ago. I still have the Nag actually I never had the 22 and I sold my 18 about two years ago. I still have the 12mm Nagler T4, Which remains one of my favorites. As far as a Paracorr goes, I never used one. Actually I had one of the originals, but sold it since I didn’t think it improved the viewing all that much in premium eyepieces. Plus the extra magnification cut down the field size, which I didn’t like either. Just my personal opinion. Thanks, Phil. Your personal opinion on such matters means more than most. I think I'm remembering you had a 22 Pan. Is this 9 mm one of the "Planetary Series"? Or is it a new 100 deg. eyepiece I've not heard of? I used to very much keep up on new introductions, but have falling into a state of contentedness with my collection of eyepieces. Ahh, an Ethos alternative. I think Zhumell and Orion marketed them too. My collection of eyepieces includes one Ethos (13mm), my only hyperwide, and probably the only Ethos I'll ever own. It was purchased back in '07. Other than that, I'm satisfied with my older eyepieces from the late 1990s/early 2000s. I love the 13 Ethos, but in some respects miss my old 13 T-6 it replaced. It was very nice in a Powermate, for example. The truth is, if I had to go back to Kellners, RKEs, Erfles and Konigs, I'd miss the modern premiums, believe me, but I would still very much enjoy observing. A number of us had some rather good views of Stephan's Quintet through the 20" f/3.3 New Moon Telescopes Hybrid Dob that was at Cherry Springs last month. Zhumell called the 9 and 16mm variants the Z100 line. I believe they are no longer available. At least, I couldn’t find any in a quick search now. The 13mm Ethos is the only one I own too. 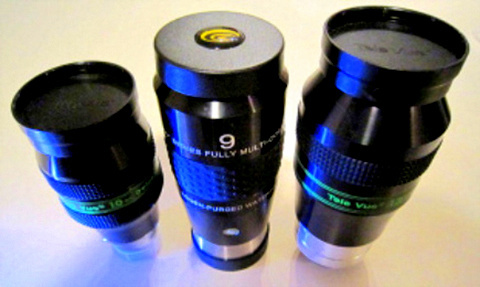 I also have the 9mm and 20mm Explore Scientific 100 degree eyepieces, however. I took the less expensive Delos route when I upgraded my shorter focal length eyepieces. With my 11" at Nightfall last weekend in Borrego Springs, CA, they were just about visible clearly with direct vision. Being a relative newbie to the dimmer DSOs, I was surprised at how small the group is. I see the quintet quite regularly in my 22 inch F/4.4 from our place in Boulevard CA, the 5 are well defined. Normally I'll use between 250x-350x It's iffier in the 16 inch.. The Baader 8-24 zoom is my favorite for teasing out faint galaxy's. There's also a number of other galaxy's in the region.. I use the 6th magnitude pair HR8604 and HR8609 as my guide posts to find NGC 7331 and then the quintet. Theres a group of 8 or more mostly 15th magnitude galaxies within half a degree of 8609. There's also some in the same field as 7331. Paracorr: Yes.. It sharpens the off axis views so coma is no longer visible. If I want a great wider field or larger exit pupil , I just take it out. About the only time that happens is when using narrow band filters. Ethos: I recent stumbled on to a too good to be true deal on the 21mm, the 13 mm and the 8mm. 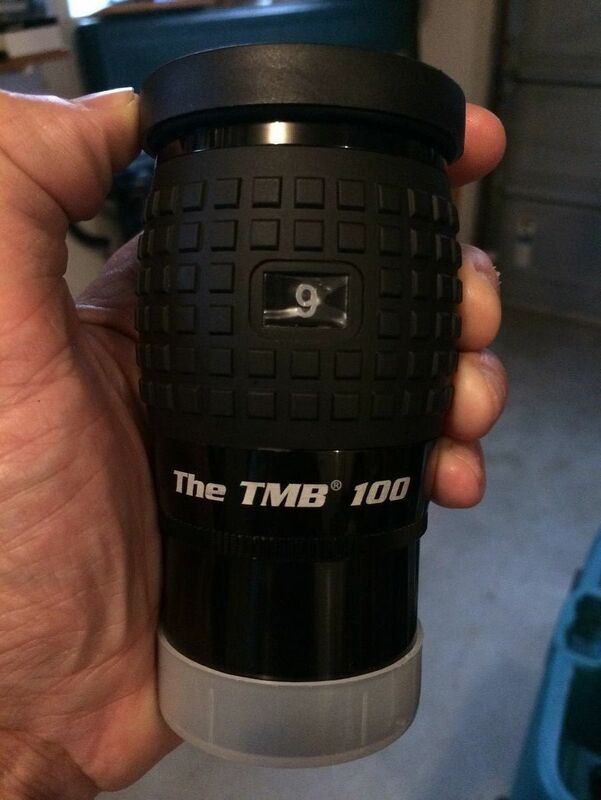 I had the 20 mm and 14 mm ES 100 degree eyepieces. The Ethos quickly became my most used eyepieces. To my eye, I can comfortably see the edge of the field in the Ethoi and it's clean and free of aberrations.. Since I recently completed my 110th Messier observation, I was up for something new and I took the challenge. Tried to find Stephans's Quintet from Okie-Tex using my 15" Obsession UC and a 21mm Ethos eyepiece (87.5x). I had no trouble locating NGC7331 but didn't pull out any of the Deer Lick group. 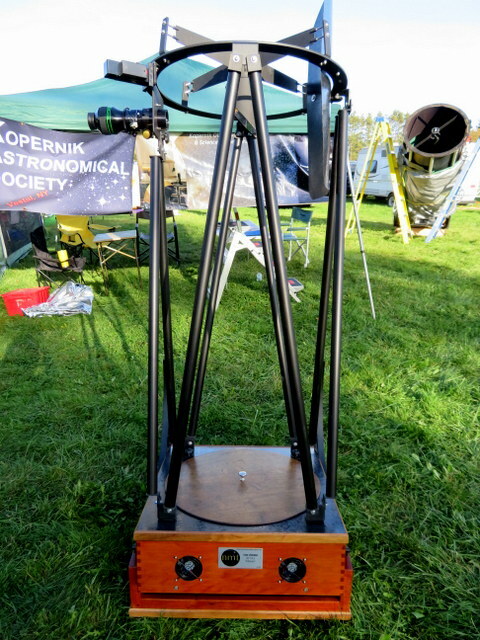 With this setup and pristine dark skies Stephan's should have been a slam dunk, but I failed to see anything. 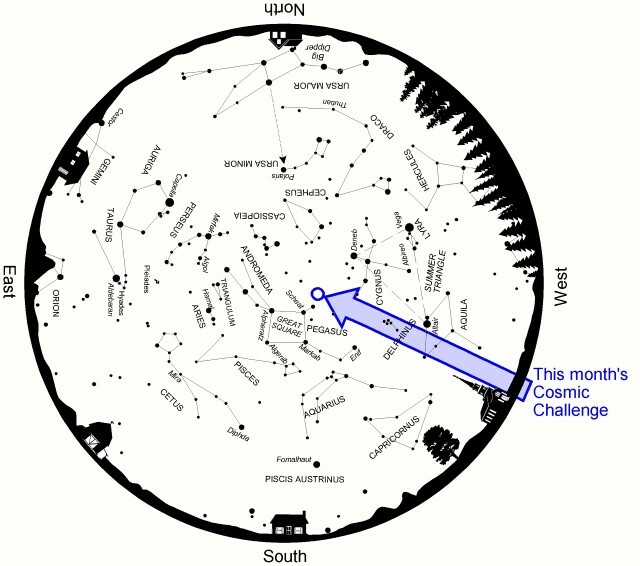 Next new moon I was out at our club's dark sky site, clear skies and good seeing, Bortle 3-4. Still nothing. Tried again the next night. I rarely bother to use the nylon light shroud, someone suggested that it may help improve contrast. Did that. Someone else suggested that I may be ruining my dark adaptation using my red LED to read star charts. I picked up and eye patch and dedicated my dominant eye to ocular viewing only. Using these two improvements yielded a very faint fuzzy patch with averted vision, not enough detail to identify which galaxy I was looking at, but there was something there. I think I should be seeing more. Maybe at the age of 70 I should be looking at Venus and Jupiter, my tired old eyes just aren't pulling in the photons like they used to. Thanks for the input, Tom. I had a thorough eye exam about 6 months ago when I began having a little problem with astigmatism. Nothing was mentioned about cataracts, so I assumed this was not a problem. I think much of my problem is in my expectations of what I think I should be seeing. I remember tracking down M33 for the first time. I looked and looked countless times in what I knew was the right spot and saw nothing. I finally spotted a patch of sky that was just ever so slightly brighter than the background. Not quite what I expected after viewing all the beautiful astro-photos. Now I can go right to it and even make out some of the brighter HII regions. It's actually a fairly easy binocular object, pops right out. Baffling definitely helped, I have one of those wide open truss tube dobs. The nylon shroud makes a big difference. And as I have learned with observational astronomy, the more (often) you look, the more you see! I dunno about chasing after elective surgery, especially to the ol' peepers. I'm from the school of don't fix it if it ain't broke. So maybe my eyes ARE broke and I'm just too stubborn to admit it. Yeah, I get the glare from stray light. Polarized glasses help. I just retired from 35 years of interstate truck driving, mostly western states. 35 years of corneal exposure to generous doses of UV. Hmm. Risk factor?